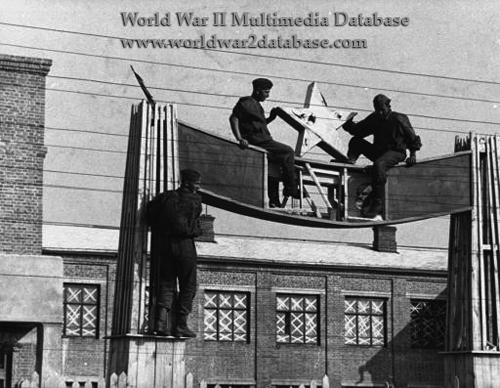 German troops remove the Soviet "Red Star" emblem from a newly occupied building. The same month as this photo was taken, the Germans created the Reichsministerium fur die besetzten Ostgebiete (Reich Ministry for the Occupied Eastern Territories) under Alfred Rosenberg (January 12, 1893 - October 1946). Rosenberg oversaw Reichskommissars who were given parts of the occupied Soviet Union to administer. While Reichskommissars had different, usually self-serving agendas, they all started immediate arrests and deportations. Ghettos for Jews were established in Minsk, Riga, Lvov and elsewhere. Einsatzgruppen arrived in the occupied territories to begin shooting Jews. Many nationalities like Lithuanians, Estonians, Byelorussians, Ukrainians and others, some of whom suffered greatly under Stalinism, expected the Germans to provide better treatment than the Soviets. Not only were they quickly disabused of this idea, they were often paid less under Nazism than Communism, worked longer hours, and had much less access food and consumer goods. The Reichskommissars were shipping everything they could to Germany. The Reichskommissar's actions led to thousands of Soviets joining partisan bands roaming the occupied territories. Rosenberg argued with other Nazi leaders that embracing the anti-Communism of Stalin's oppressed would strengthen the German war effort. Rosenberg, intellectual and uncharismatic, was unable to change German policies; instead he bought into Hitler's war of annihilation. He became a major architect of the Holocaust, directly or indirectly killing millions of Jews and Soviet prisoners of war. Rosenberg was hanged after his conviction in the Nuremberg Trials.